One Pillar Pagoda of Thu Duc (Chua Mot Cot Thu Duc; 1/91 Ð Nguyen Du, Thu Duc district). 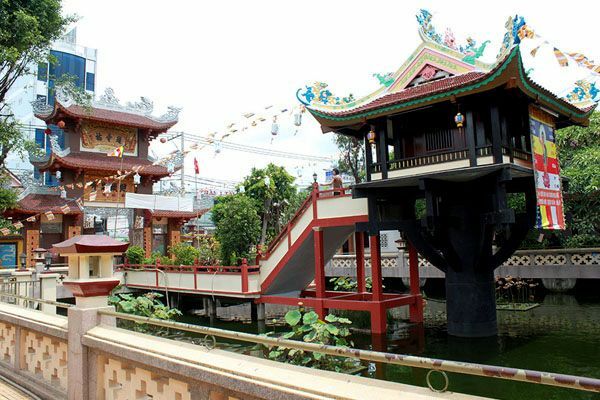 Modelled on Hanoi’s One Pillar Pagoda, the structure is similar but not identical, consisting of a small, one-room temple hall rising on a pillar above a pond, containing a multiarmed image of Quan Am, Goddess of Mercy. At the rear of the compound are tombs holding urns containing bones of monks and other Buddhist faithful. Hanoi’s original pagoda was built in the 11th century but rebuilt after destruction by the French in 1954. When Vietnam was partitioned during the same year, many Buddhist monks and Catholic priests fled south to avoid possible persecution. One monk from Hanoi, Thich Tri Dung, petitioned the South Vietnamese government for permission to construct a replica of Hanoi’s famous One Pillar Pagoda. However, it was denied by President Ngo Dinh Diem, a Catholic with little tolerance for Buddhist clergy. Nevertheless, Thich and his supporters raised the funds and built the pagoda in 1958, in defiance of the president’s orders. At one point the Diem government ordered the monks to tear down the temple but they refused, despite being threatened with imprisonment. Faced with significant opposition, the government’s dispute with the monks reached a standoff. However, the president’s attempts to harass and intimidate the monks in a country that was 90% Buddhist did not go down well and ultimately contributed to Diem’s assassination by his own troops in 1963. The pagoda is 15km northeast of central Hochiminh city. Traveller cafes and travel agencies in HCMC should be able to put together a customised tour to the pagoda or to arrange a car and driver for you.